One of the oldest methods of hunting coyote is to use a bow and arrow; and in recent years that method has taken on a type of renaissance. Hunters are more and more willing to face the awesome challenge of hunting coyotes using this method which goes back thousands of years. Before you put away your rifle however, just know that you need to be a super bow hunting shot, and able to judge distance acutely well. 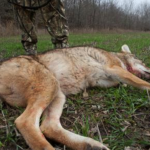 Bow hunting coyotes can be a terrific “rush,” a lot of fun, and of course very challenging. Hunting during the day or hunting at night poses several different and diverse obstacles. First of all, when it’s daytime you have maximum visibility – but then so does the wily, wary, and keen eye sight/hearing coyote. 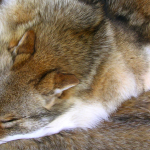 So you need to be totally concealed, and when using a bow and arrow you have to get the coyote to come in to very close range – -usually within 30 yards – -which is considered the maximum range for an optimum, accurate and clean bow kill. During the day when you shoot, you can literally see what you’re shooting at, and you can also see any obstacle between you and the target. You aim to avoid those obstacles. You also must be good at “calling” and setting up appropriate decoys. We’ve discussed how to do both in a previous article, which is available on this site. As for the type of bow you should use, there are choices. The most traditional is the long bow- – which many “purists” still insist on using. 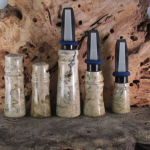 It’s the ultimate statement of traditional hunting which goes back to near pre-history. The long bow however is for the most part the least accurate, and can be very cumbersome to lug around. 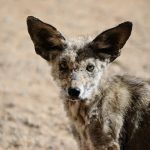 It can also be “noisy” in the sense that you may brush up against a branch and the like, causing the coyote to become alerted to your presence. Another group of coyote hunters utilize the recurved bow, made famous by the likes of Gengis Khan’s Mongol hordes, the Japanese and other Asian and Indo-European cultures. These recurved bows are far shorter than the long bow, quite powerful and allow the user to shoot them, while on horseback. That’s why Gengis Khan was so successful! Now to “modern times,” and the compound bow, which is used by some 95% of coyote bow hunters. The compound bow has cams, wheels, stabilizer bars, and adjustable sights, which allows the hunter to use it with ease, get off fast multiple shots, as well as providing excellent accuracy. It is short, small, and easily concealed, which is critical. Carbon or aluminum arrows are used, and a supremely nice thing about using a bow is that it’s “silent,” and will allow you to get more than one coyote during a single hunt. If you use a rifle, you get off one shot, and any other coyotes in that pack, or in the general area will immediately scurry off. It’s usually “one and done” with a rifle. Not so with a bow. And don’t forget, coyotes generally hunt in packs of two or more animals. Not always mind you, but generally they do. So you’re going to get opportunities to take more than one coyote during a single hunting opportunity when using a bow and arrow. And don’t kid yourself –it all sounds good and easy, but it isn’t. “No amateurs need apply.” Hunting coyotes with a bow and arrow is a real challenge, and most newcomers to the sport end up getting skunked – at least initially. Me included. In passing I want to mention the crossbow. More and more states are enacting regs which allow greater use of the crossbow. They are real easy to use, and have excellent killing power. However, their use is often restricted to the disabled, senior citizens of a certain age, type of animal being hunted, or special affinity groups. Check your state and area regs. If using a crossbow is allowed for you, you might want to consider it. 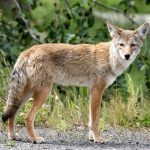 For the most part coyotes don’t move as much during the day, as they do at night – that is, unless they’re pursued or pushed. Coyotes are generally nocturnal hunters, and night is when coyote hunting with a bow takes on a whole separate character. I admit from the get-go, that I’ve never gotten a coyote while bow hunting at night. But I’ve been with others who have, and it’s a total emotional “blast.” Like nothing else I’ve ever experienced. Talk about “high-fives” – -wow! It’s something real special. First off, when bow hunting at night, you won’t see any small obstacles like a tree branch, twigs, or even a barbed wire fence. These obstacles will deflect your arrow causing you to miss. Therefore having a clear shooting lane is a must. And you’ve got to know what you’re shooting at and how far the target is from you. When you judge distance during the day, you may be very good at it, but when you judge distance at night, it’s a whole different ball game. For myself, and for those who I’ve been with, 20 yards looks like 40, and 40 looks like 80. In the dark, everything looks further away than it really is. You need to have some type of bearing to look at, when gauging distance. And that’s isn’t easy. A lot of companies have at least partially solved this night sighting problem by incorporating what is called “lighted sight pins” in their sights (I recognize there are many different types of sights for bow hunters, but they all have the same goal in mind). A sight on a bow will have gradation pin settings which allows the hunter to line up perfectly on your target. That’ can be at least comparatively easy during the day. At night, that wasn’t possible, until lighted sight pins came along. This allows you as a hunter to key in on your target, and the small glowing light allows you to line up your sight perfectly – – if your pre-set sighting gradations are exactly the distance the animal is from you. However that is not always possible “in the real world,” and these sight pins will not give you any help when it comes to judging DISTANCE – -especially at night. In this situation, you’re going to literally have to “hit and miss,” until you become familiar with the distance distortion which is inherent at night, as we have discussed. I ruefully admit, I still haven’t gotten it down to where I’m confident and comfortable in judging distance at night. In other words you have your lighted sight pins. Fine. You have set your sight pins for the distance YOU THINK the coyote is from you. Gradations on your pin settings may be at 10 yards, 20 yards, 30 yards ,etc. But that doesn’t mean you’ll be right. The sight pins will line up on the coyote, but if you think the animal is 20 yards away, it may actually be at 40 yards, and while lined up on the target, you’ll be at the wrong distance. So what you do is have to “adjust” the angle of your bow if you miss. You may be short a few inches, you may be long a few inches. You will raise or lower our bow accordingly. You’re literally “guessing” as to distance when you use your sight pins. And don’t kid yourself, it happens during the day, too. You think an animal is a certain distance, and you’re way off. 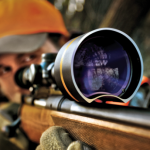 It’s a common occurrence – -and even to very experienced hunters. And yes there is a quick and easy solution to all of these sighting machinations when it comes to pin settings. Buy yourself a range finder, and if you’re really into it, get yourself some night vision equipment. The problem with these is their cost. For instance a modest range finder will run you at least $100, and I’ve seen them upwards of $500. And as far as night vision equipment- – “don’t ask,” as they say. I don’t have big bucks to spend, so I have to “learn” to use the equipment I have. From what I’ve seen most hunters are in the same boat, but I want to at least give you an “out” if you’ve got the money to spend. One more excellent item for night coyote hunting is the “lighted noc.” It’s part of the arrow that attaches to the bow string. These are battery operated lights, so when you shoot your arrow, it’s almost like a tracer round from a gun. You can see exactly where the arrow travels, when it strikes, and then you can retrieve it (most arrows pass all the way though a coyote when struck, they being a small animal) easily. When you find the arrow embedded in the ground, it’ll also give you a good head start as to where the animal itself is located. 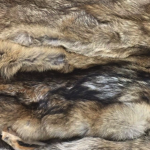 I suggest that if you’re already a coyote hunter and want to try something different, hire a guide or go out with someone with a lot of experience and learn how to bow hunt coyotes. It’s never going to be easy- -that much I promise you, but when you do get one, you’ll know it was a real hunt, and you were able to overcome some daunting obstacles.